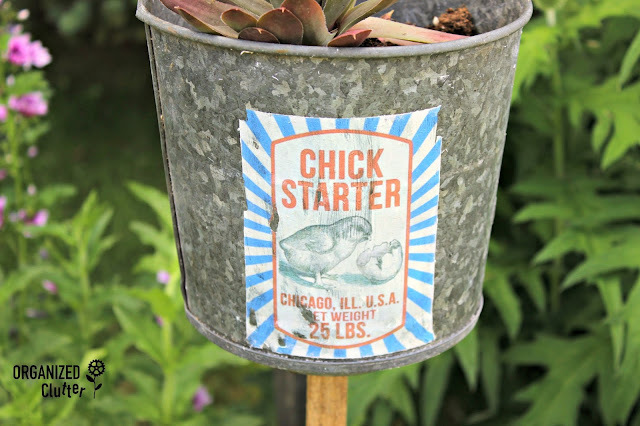 My first chick starter project started out with the top part from a Hudson chicken feeder that I purchased for $3.75. First I drilled drainage holes in the top of the Hudson feeder and a hole in the center for a stake screw. So from the inside I screwed a Phillips wood screw and washer into the garden stakes (like my coffee pot planters). Make a pilot hole in the stake. This rough garden stake package of 6, purchased at Menards for about $5. Next I purchased the premium membership from the Graphics Fairy at $9.98/month and used a graphic from the Roosters and Hens Premium Bundle. The membership is month by month and you can cancel at any time! Check out the Graphics Fairy blog if you haven't already! 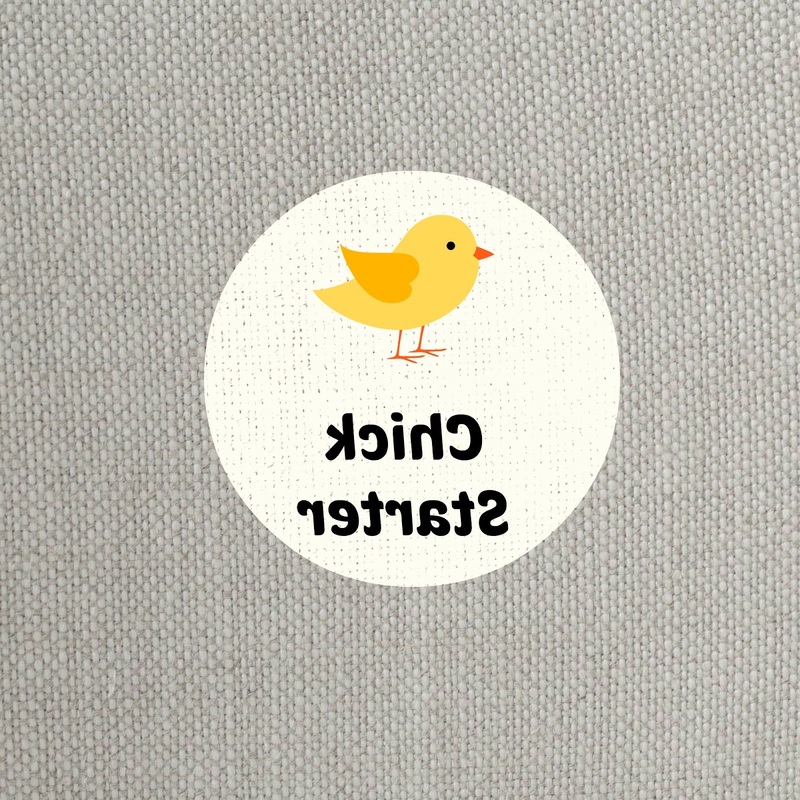 I used the Chick Starter graphic and applied it with Mod Podge Photo Transfer product. The regular matte Mod Podge works as well but I needed a white background instead of clear for my faux vintage label. 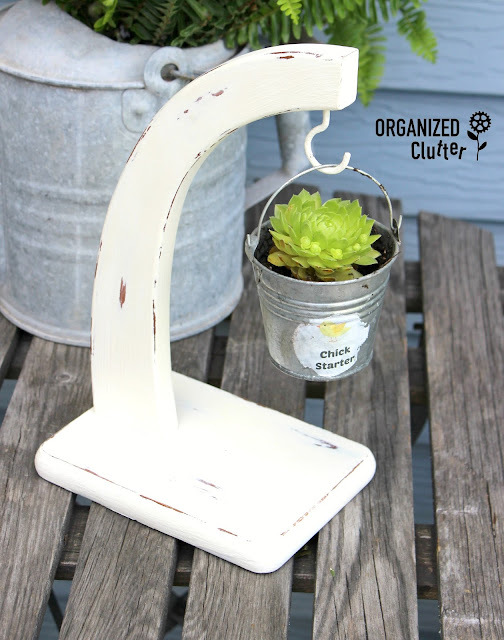 It would have blended into the galvanized metal with regular matte Mod Podge that dries clear. The Mod Podge image transfer method is all over Pinterest. It's easy and anyone can do it. Just be careful and don't rub off the glue image. I have a few spots where the image pulled away but it works as I am looking for a vintage label application. Plant a HEN in the pot. Sempervivums perennial. Spray with Krylon matte sealer. I used about 6 coats. You could also brush on a water based poly finish or both. Stick the stake in the garden or in a large flower pot! It's a fun pun! 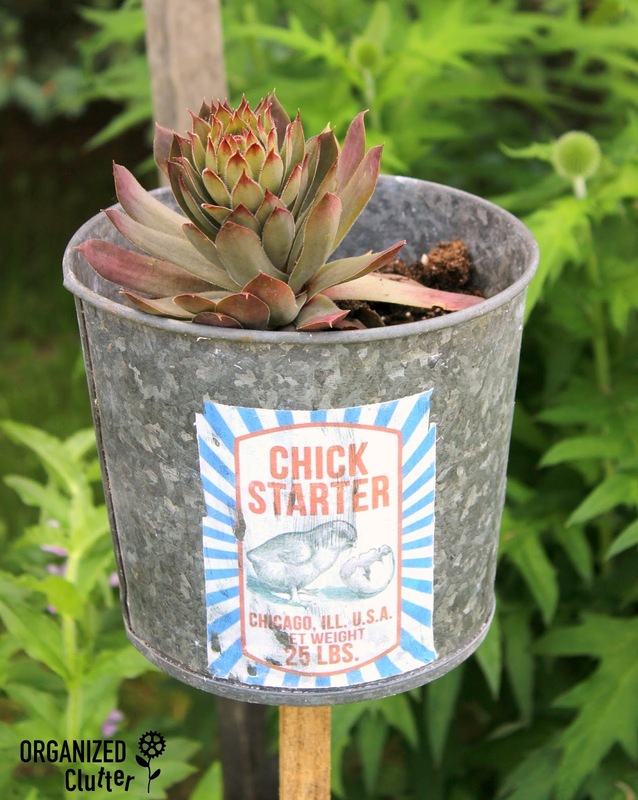 Chick starter! Next, I took a craft candle wax, small galvanized look pail 2 3/4" tall. 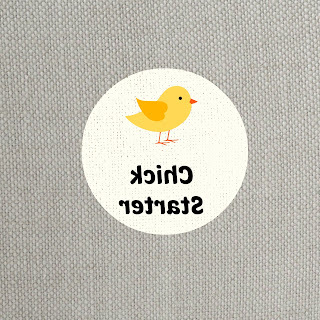 This time I made my own graphic on Picmonkey. I ended up using just the circle part. This label is also frayed, vintage looking around the edges. 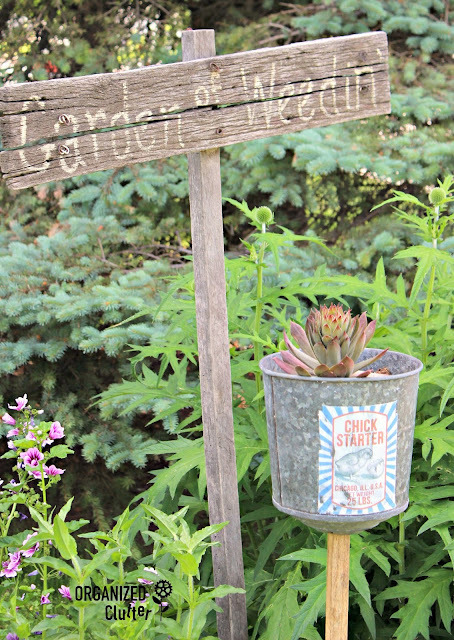 I hung the little chick starter pail from one of my painted banana stands! Banana stands are always available at thrift shops. 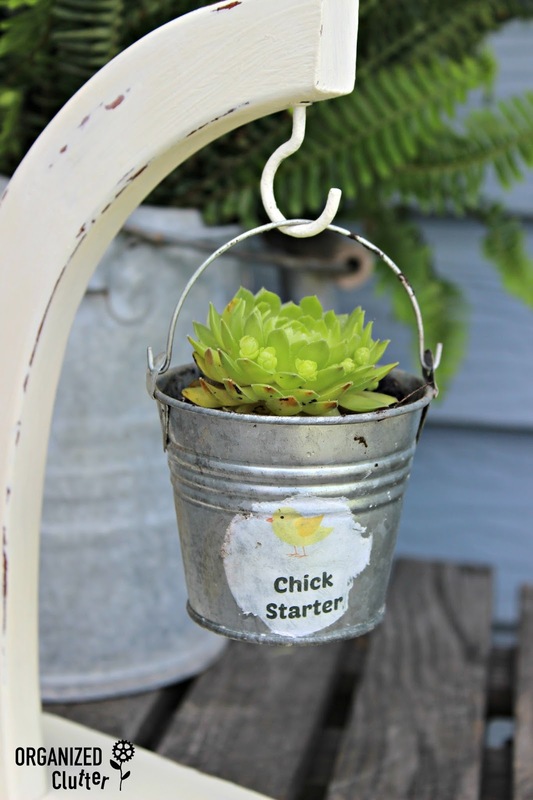 Paint one, distress one, and hang your mini bucket with chick starter label on it or a small houseplant! These are all such cute ideas, Carlene! Only you could come up with this cute idea. I could have starred at that chick starter all day and never think to do that.